There are two ways you can terminate an employee. Clicking this button simply marks the employee as inactive and will no longer be eligible for pay runs. Please note that terminating an employee will not process a termination payment. 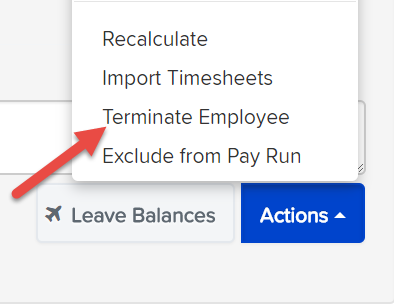 Enter the employee's termination date and then click on "Save". The employee's record will turn pink (as an indicator it is in termination mode) and will display calculated earnings and any accrued leave to be paid out as part of the termination pay. Any leave categories setup to not accrue automatically will not appear in this section. N.B. If the employee is set up to be paid default standard hours each pay and is terminated mid-pay period, the employee's hours will automatically be re-calculated on a pro-rata basis. We strongly suggest you double check these hours to ensure they are correct. 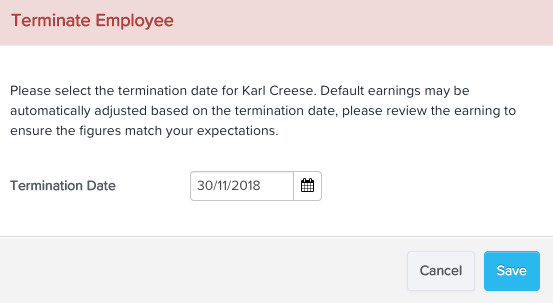 Once you have finalised the pay run, this employee will no longer be active or eligible to be included in future pay runs and the employee line will be highlighted red. Note: If there are any unfinalised pay run for the employee, you will not be able to terminate until those pay runs have been finalised. 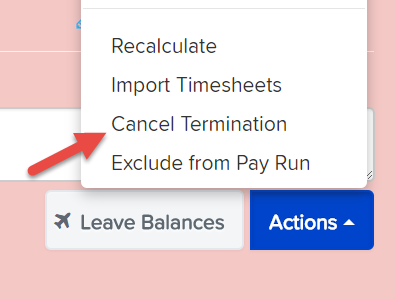 If you want to cancel the termination, click on the blue "Actions" box within the employee's pay details and then click on "Cancel Termination". Instructions on how to process a redundancy or ETP for an employee can be found here. See here https://www.ato.gov.au/Rates/Schedule-7---Tax-table-for-unused-leave-payments-on-termination-of-employment/ for further information.